Shown above is the model 139 from 1939. 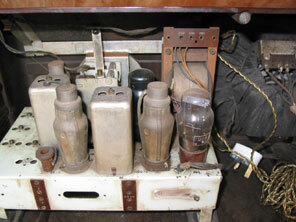 This is a four valve plus rectifier receiver in a bakelite cabinet emblematic of the Art Deco style. The cabinet features a speaker cloth protected by bakelite bars that follow the cabinet lines around the corner to the side, a feature often seen in buildings of the time too. Shown right is a view of the Apollo Theatre in Wilton Road, Victoria, London. The architects were E. Walmsley Lewis & W.E. Trent, and the building was constructed in 1930. Although another building has been built tight up against this one the horizontal lines following the perimeter of the building may be clearly seen. The model 139 was also available as the model 239, where the same chassis was used in a wooden cabinet (that was totally uninspiring). 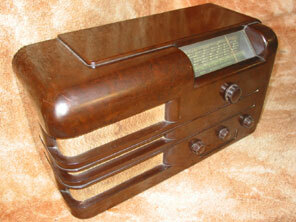 The 139 is actually a development of the Ferranti "Prestune" receiver from 1938. This was a pushbutton set housed in the same cabinet, but the likelihood of war seems to have persuaded Ferranti to dispense with the pushbutton feature. The same bakelite cabinet press has been used though. The pushbutton unit was situated immediately beneath the three smaller control knobs, and the space is simply blanked off with a further piece of bakelite for the model 139. The receiver originally cost £9.9.0, and featured a valve line up of 6A8G, 6K7G, 6Q7G, 6F6G, R4. The receiver circuit does not have any particularly interesting or notable features. I find this to be one of the most pleasing bakelite cabinet designs, and this model seems to be quite rare - it certainly took me a good few years before I found one.